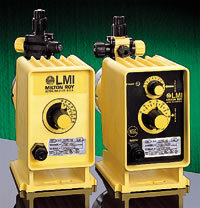 LMI Chemical Metering Pumps have been an industry standard for over 20 years. The familiar yellow and black pumps have a rugged, totally enclosed, chemically resistant housing for protection in the harshest environments. Encapsulated electronics and a rigid housing and stroke bracket ensure years of precise, repeatable performance. 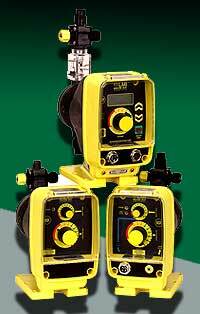 Several control options are available for all applications and budgets. Series AA, B & C Type “7” : The stroke rate may be controlled manually or by a digital input. The optional Micropace Control Modules enable the user to divide or multiply a digital input or respond directly and proportionally to a 4 – 20 milliamp input. A low level input is standard. Series AA, B, C Type “1” is used when manual or on/off control is all that is required. Dual manual control of stroke speed and stroke length are provided. 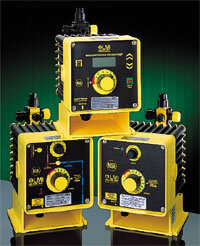 The Series P Metering Pump is designed for more ecomomical chemical injection. Dual manual control of stroke speed and length and fixed speed versions are available for simple manual or on/off control. Totally enclosed, chemically resistant housing provides protection in the harshest environments. Encapsulated electronics and a rigid housing and stroke bracket ensure years of precise, repeatable performance. Several control options are available for all applications and budgets. *Individual spare parts kits are available for each liquid end, containing 4 seal rings, 4 balls, 1 spring and 1 diaphragm.